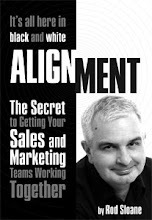 Sales and Marketing Alignment Blog from Rod Sloane: Does your friendly local Printer do this? Purbrooks are a Wimbledon based printing company that lead with being green, vegetable based inks, low wastage and stuff like that. So what you might think? But it's what else that Purbrooks and Martin Stern does that is of interest. Along side the printing company runs a branding company Visual Direction that helps with design, brochures, identity and branding. A printing company that is also a marketing house. Wow! I have long believed that printers should be the best marketeers out there and should be advising clients on marketing not paper size? Does your printer help you win more business or just talk about delivery schedules? What else should you really be helping clients do? How can you really help their business?